A leaf fluttered in through the window this morning, as if supported by the rays of the sun, a bird settled on the fire escape, joy in the task of coffee, joy accompanied me as I walked. I’m a coffee drinker, one of the multitudes who must have their daily java in order to join the world. I’m a member of that group who is addicted to the caffeine buzz. I especially love lattes and the hot milky comforting feeling I get when I take my first sip. That first sip anchors me to the world and defines my space within it—especially if I’m drinking my favorite brands from my favorite coffee hangout. 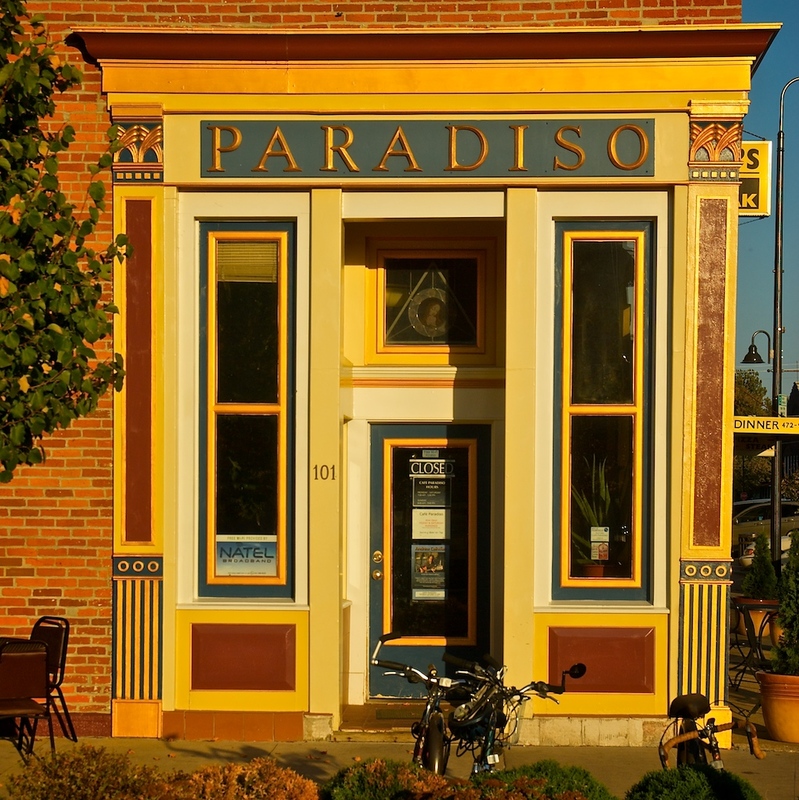 Steve Giacomini, owner of our award winning coffee shop, Café Paradiso, once gave me a little talk on coffee and told me why his brand is superior to most brands, especially Starbucks, which he considers a bastardization of coffee (they burn the coffee beans, he says). Steve created his own blend of organic, shade-grown, fair trade beans, which he roasts daily on-site. His beans make a mean cappuccino, latte, mocha, or espresso. And, I like my coffee to be politically correct and eco- friendly. I’m grateful Steve taught me some things about coffee and how the love you put into making it can create miracles. So, our little town of Fairfield, Iowa has become recognized by world travelers and local residents alike as a place where we can get world class coffee. And, in the tradition of great locally owned coffee houses worldwide, it has become one of our town’s havens for artists and musicians where local and international talent makes its way onto its stage to perform for its loyal patrons. If you come this way, I’m happy to take you to coffee! Hey Debs, thank you!!!! Lets play some scrabble one of these days? I didn't coin the phrase, "the meditating town," but was amused when I heard our little town in the middle of the heartland labeled as such by a passerby. But, I'm eclectic, so please don't pin me down. Thank you for visiting my blog, and most of all, Om Shanti. We are a Queer/Trans Prisoner Solidarity Project in the SF Bay Area. We envision our work as direct solidarity with our community on the inside through letter writing, visits, political education and community organizing.